Now here are some very special, fantastic humans that I fell in love with. There are lots of ways that people find photographers and that photographers find couples. One of the most unexpected ways for me personally to find couples is through Craigslist. But here I found Sylvie and John searching for a wedding photographer and they sounded like swell humans so I sent them over a message. As you can see- we decided to become a team. Two awesome humans and one little photographer. We went on an adventure to the coast. 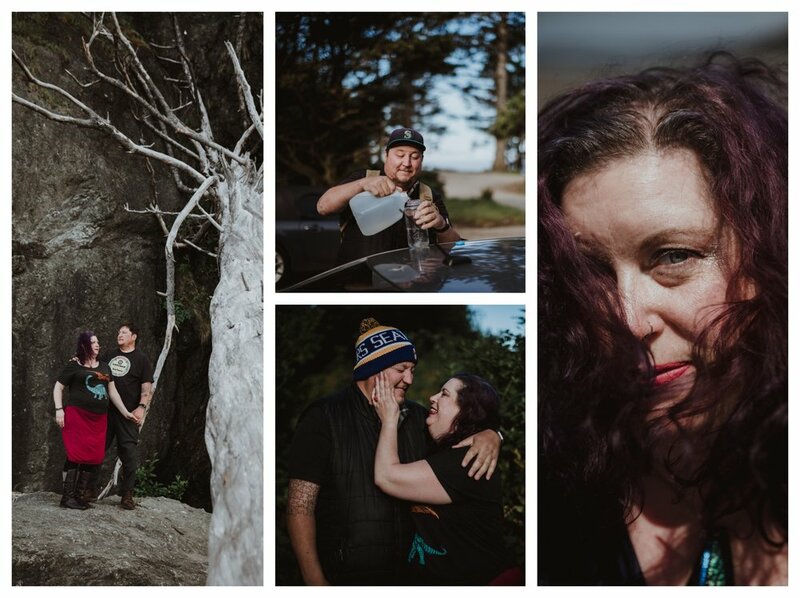 Sylvie & John made a date weekend out of it so it wasn’t just a long drive, an epic shoot, and then off home again. We got to know each other pretty well- we all have a mutual love of cats (check out my instagram stories if you did not know this), I learned about John’s crazy hiking adventures up the West Coast (best coast), gained mad respect for Sylvie who bikes in Seattle, and got to hear lots of fun stories about the two of them (like how John had to propose three times!). The wedding was fun, full of joy and I learned so much more about Sylvie & John than I ever could have in conversation. Let me talk for a moment about why I think Sylvie & John are particularly wonderful human beings. Here are four very different women wearing four very different dresses. They chose those dresses, Sylvie didn’t require a certain type of dress or attire. Each woman’s unique personality is reflected in the way they chose to dress. The lovely lady second from the right is holding a purse Sylvie’s sister (far right) made for her. The spunky lady second from the left cat walked right down that aisle and you would swear she was Kate Moss- and she loved every minute of it. These women represent why I fell in love with Sylvie and John. Each of these women possess an individual and gorgeous soul that is outside of the ordinary. As I walked around the venue (Stocker Farms) I realized something amazing. Every person here was dressed how they wanted, no matter how wild or tame. People of all kinds were there and filled with joy celebrating these two beautiful humans. I felt like I was back in art school- an incredibly diverse place filled with the whole spectrum of humanity and each person surrounded by an ocean of love and acceptance. Sylvie and John are the heart of a community-nay, family- of all the people that society would consider weird, odd, outcasts, or out of the box. The colorful people of the world that make art, make you think, and give existence depth and meaning. I felt right at home here. And it’s all because of Sylvie & John.